Following up on the interest that SocDevJustice has taken in promoting universal social protection floors by focusing on issues in their financing, Barry Herman wrote a paper for the Civil Society network "Global Coalition for Social Protection Floors", of which SocDevJustice is a member. It was published by Brot fuer die Welt in April 2018 as "Sustainably Financing Social Protection Floors Toward a Permanent Role in National Development Planning and Taxation". See and download paper here >>>. Importantly, in 2017, the Independent Evaluation Office (IEO) of the International Monetary Fund prepared a critical assessment of IMF involvement in social protection policy issues, especially in the context of the typical negative impact on social protection programs when countries approached the IMF for assistance in recovering from macroeconomic crisis situations. See document including background papers here >>> https://ieo.imf.org/en/our-work/evaluation-reports/Completed/2017-0724-the-imf-and-social-protection. The IMF responded to the IEO report by undertaking a year-long reflection in 2018 on what its role should be regarding social protection expenditures and their financing in its annual macroeconomic surveillance of IMF member countries and when IMF is called upon to assist countries come out of crises. See IMF paper here >>> and at https://www.imf.org/en/Publications/Policy-Papers/Issues/2018/02/02/pp011718-imp-in-response-to-ieo-report-on-imf-and-social-protection. The review was meant to lead to the adoption of an "institutional view" on the role of IMF in social protection, which is to be followed by a guidance note for IMF staff going on country missions. IMF anticipates presenting the "institutional view" paper to its Executive Board in May 2019. IMF has sought the views of stakeholders in its process of reflection and SocDevJustice in this regard has contributed as joint author of a paper prepared for the Global Coalition for Social Protection Floors. It was circulated to IMF Executive Directors and senior staff in January 2019. This paper can be accessed and downloaded here >>> . The NGO Committee on Financing for Development, Social Justice in Global Development, Brot für die Welt, and the Virginia Gildersleeve International Fund jointly organized a session on financing universal social protection in developing countries at the Civil Society Forum of the 2017 Annual Meetings of the International Monetary Fund and the World Bank. Governments at the United Nations agreed in May 2017 to discuss aspects of the financing of “social protection systems and measures, including floors” during the next meeting of the Financing for Development Follow-up Forum, which will take place in New York on 23-26 April 2018. This would be the first opportunity for a broad, intergovernmental discussion of policy experiences and needs regarding the financing of social protection and it seemed important to the organizers of this civil society session at the Fund/Bank Annual Meetings to alert the development community to this upcoming event. To this end, the session brought together senior representatives of the International Labor Organization, the International Monetary Fund, the United Nations and the World Bank, as well as a representative of the civil society Global Coalition for Social Protection Floors. In February 2016, SocDevJustice began a project to help build international and intergovernmental discussion and support for strengthening the sustainable and assured financing of social protection floors (SPFs). The project sought to build on the work of the International Labour Organization on the inclusion of social protection as one of the cross-cutting policy foci of sustainable development. Gemma Adaba and Barry Herman accepted to be co-directors of the project and in March 2016 they began to design and carry out the project. This note is their report on the activities of the project, its results as of end-June 2017, and envisaged next steps. The world’s governments pledged in September 2015 to fully eradicate extreme poverty in 15 years, when their leaders adopted the 2030 Sustainable Development Agenda at the United Nations. The same governments adopted a new social compact when they adopted the Addis Ababa Action Agenda on Financing for Development in July 2015. One strategy to help implement that compact is to develop strong social protection floors (SPFs) in all countries to provide universal protection across all segments of each country’s population. Not only should such floors be instituted where they do not yet exist, but they should be financed in assured and sustainable ways, no matter the volatility and unpredictability of world events. SocDevJustice has undertaken an initiative to help bring this about through focused and credible analysis and advocacy, including by building support for specific reforms and initiatives at United Nations and other international forums, working toward political consensus and commitments that lead to policy changes on the ground, including regarding appropriate domestic and international public financing. Social protection includes adequate transfers in cash or in kind for all contingencies occurring across the life cycle, such as cash transfers for children; benefits and support in times of maternity, disability, work injury or for those without jobs; and pensions for all older persons. Member governments, employers and unions of the International Labour Organization in 2012 adopted ILO Recommendation on Social Protection Floors (No. 202), and in 2015, Member States of the United Nations adopted the 2030 Agenda for Sustainable Development, which contains Sustainable Development Goal 1.3. It calls for implementing nationally appropriate social protection systems and measures for all, including floors, and by 2030 achieving substantial coverage of the poor and the vulnerable. To this end, UN country teams are working to improve social protection systems. In addition, the World Bank and ILO launched the Global Partnership for Universal Social Protection in September 2016. The SocDevJustice Initiative aims to support this global commitment through a focus on adequate and sustainable financing of social protection floors in both good and bad times. On 30 November at the United Nations in New York the Financing for Development (FfD) Office and the ILO organized an expert group meeting to explore coherent funding modalities for the social protection floor component of the social compact. It was one of five expert group meetings that the Inter-agency Task Force (IATF) on Financing for Development hosted as part of its responsibility to monitor and report on the implementation of the Addis Ababa Action Agenda on FfD. The Task Force members contributed to the discussion and received expert input from a number of invited academics, experts and other external stakeholders, including the following from the SocDevJustice Initiative: Gemma Adaba, Anis Chowdhury, Michael Cichon, Barry Herman, Katja Hudjo and Isabel Ortiz. The aim was to discuss country experiences in financing social protection floors in order to explore some lessons learned and raise new or innovative ideas for sustainable financing of universal social protection systems, including floors. The internationally negotiated Addis Ababa Action Agenda on Financing for Development adopted in July 2015 contained a promise to create a new intergovernmental forum to follow up on implementation of the Addis Agenda and the Means of Implementation of the 2030 Agenda for Sustainable Development. The United Nations General Assembly agreed to hold the third International Conference on Financing for Development (FfD) on 13-16 July 2015 in Addis Ababa, Ethiopia. This is an important opportunity to overcome disappointing experiences on international cooperation and forge a concrete programme of work on a number of pressing development issues. The central question right now is what programme of work might win endorsement with less than one year’s preparation? Which ones are worth fighting for? What reforms or programmes are attainable? Social Justice in Global Development seeks to stimulate concrete discussion of these questions among interested parties. The first FfD conference at Monterrey, Mexico in 2002 led to significantly increased official development assistance (ODA), more effective ODA, modestly upgraded UN international tax discussions, a modestly improved voice of developing countries in decision making at the International Monetary Fund (IMF) and the World Bank, official acceptance of the principle that poor country debt-servicing should not impede their advancement toward the Millennium Development Goals, and so on. Frankly, many of the initiatives endorsed at Monterrey were not successful, such as the Doha Development Agenda of negotiations at the World Trade Organization (WTO) and the design of a mechanism for a fair and effective resolution of sovereign debt crises at IMF. But what Monterrey did agree was to try to advance various proposals in particular intergovernmental venues, setting in motion or endorsing serious efforts to address them. Especially in light of the short time for preparation, it is doubtful that more than that can be attained at the Addis conference. But it would be worth attaining such a work programme. The Addis FfD conference also has to be seen in the context of the preparations for the “post-2015 development agenda” that governments have agreed to launch at a meeting of heads of state at the UN General Assembly in September 2015. It is expected that the agenda will aim to realize a set of Sustainable Development Goals, a draft of which was agreed on 19 July 2014 by the Open Working Group of the Assembly, which had been set up for that purpose. The Assembly also established the Intergovernmental Committee of Experts on Sustainable Development Financing which will conclude its work and present options for sustainable development financing in September 2014. While that committee works behind closed doors, people who have seen its draft report say it will not break new ground. The Addis meeting will thus be the primary opportunity to agree to a specific work programme on international cooperation before the heads of state convene in September 2015. While the major impediments to global cooperation cannot be overcome in a year, a number of limited but promising steps could be agreed in Addis, which itself would give multilateralism a boost. What is required is to identify a package of these steps that are broadly desirable to civil society and that might attract governmental and multilateral institution champions, building an expanding coalition of campaigners and actors who see the value in capturing opportunities at Addis. Thankfully, there is a great deal of work underway on specific policy issues that might be advanced at Addis. Some of the work is in international organizations, some in civil society organizations and some in academia. Thankfully as well, the scope of FfD is broad so that almost any issue could be included. As perusal of the Monterrey Consensus shows, it encompasses domestic economic, social and financial policies, foreign investment and other private flows, trade, ODA and other official flows, including innovative sources of public finance, sovereign debt and systemic issues, including not only addressing sources of global financial instability and improving global economic governance, but also means for promoting coherence among international economic policies of nations and international institutions. Social Justice in Global Development offers to facilitate consideration of possible initiatives for Addis by posting well-argued proposals for reflection by colleagues and friends. In the context of the UN High Level Dialogue on Financing for Development and the presence of a number of senior officials and experts, the Permanent UN Mission of Chile, the Ralph Bunche Institute and Social Justice in Global Development held a consultation at the UN Headquarters on 9th October 2013 on the "Imapct ofdomesticandinternational environments on sustainable development financing". About 45 representatives from Governments, institutions and civil society participated. The following points were discussed: For many Governments from North and South,“Monterrey” remains a benchmark for international cooperation for development owing to its insistence on the holistic policy agenda, its processes formultistakeholderdialogue, andits success in building political momentum for stronger cooperation. A number of Government representatives thus recommended holding a “MonterreyPlus” conferencein the firsthalf of 2015 to promote “sustainable and equitable development”. A more enabling domestic environment includes an effective and adequately financed government. It would strengthen the domestic financial sector’s ability to arrange long-termfinancing and develop appropriate access of the poor and small and medium enterprises to financial services. It was proposed that policy makers consider alternativeoptionswhendeciding the proper role of government and public institutions in development financing. A more enabling international environment would lessen the systemic sources of the continued high risk and volatility of international financial flows, including bycounteringfinancialindustry efforts to dilute international regulatory standards. It would promote more internationally coherent sets of macroeconomic policies (as opposed touniversalausterity), as wellas reform the international financial and trade architecture, for example by increasing fairness in the system of intellectual property rights and introducingasovereign debt workout-mechanism. There was considerable skepticism about the strategy under discussion in some quarters to overcome the envisaged shortfall in official development assistance (ODA) by using aid to “leverage” private funds, especially as regards tapping for-profit pools of investment funds and investment by corporations. There was also fear that the partnerships that didresult would redirect ODA into the priorities of the private partners instead of social development purposes. Interest was also expressed in promoting effective innovativesourcesoffinancing for development. ECLAC will soon host another meeting in Santiago on this topic. There will likely be a continuing dialogue of official and non-state stakeholders on financing sustainable development. Contrary to public perception, austerity measures are not limited to Europe; in fact, many adjustment measures feature most prominently in developing countries. According toIMFdata,119 countries will be adjusting public expenditures in 2013, increasing to 131 countries in 2014 and the trend will continue at least until 2016. This is revealed in a globalupdateonausterity, co-published by IPD and the South Centre: “The Age of Austerity – A Review of Public Expenditures and Adjustment Measures in 181 Countries”. The paper examines the latest IMF government spending projections for 181 countries by comparing the four distinct periods of 2005-07 (pre-crisis), 2008-09 (crisis phase I: fiscal expansion), 2010-12 (crisis phase II: onset of fiscal contraction) and 2013-15 (crisis phase III: intensification of fiscal contraction); (ii) reviews 314 IMF country reports in 174 countries to identify the main adjustment measures considered in high-income and developing countries; (iv) discusses the threats of austerity to development goals and social progress; and (v) calls for urgent action by governments to adopt alternative and equitable policies for socio-economic recovery. In a first phase of the global economic crisis (2008-09), most governments introduced fiscal stimulus programs and ramped up public spending, as the world was able to coordinate policies. However, premature expenditure contraction became widespread in 2010, which marked the beginning of the second phase of the crisis, despite vulnerable populations’ urgent and significant need of public assistance. In 2013, the scope of public expenditure consolidation is expected to intensify significantly, impacting 119 countries in terms of GDP, and then steadily increase to reach 132 countries in 2015. The latest IMF projections suggest that this trend will continue at least through 2016. Regarding austerity measures, a desk review of IMF country reports published between January 2010 and February 2013 indicates that governments are weighing various adjustment strategies. These include: (i) elimination or reduction of subsidies, including on fuel, agriculture and food products (in 100 countries); (ii) wage bill cuts/caps, including the salaries of education, health and other public sector workers (in 98 countries); (iii) rationalizing and further targeting safety nets (in 80 countries); (iv) pension reform (in 86 countries); (v) healthcare reform (in 37 countries); and (vi) labor flexibilization (in 32 countries). Many governments are also considering revenue-side measures that can adversely impact vulnerable populations, mainly through introducing or broadening consumption taxes, such as value added taxes (VATs), on basic products that are disproportionately consumed by poor households (in 94 countries). The paper questions if the projected fiscal contraction trajectory—in terms of timing, scope and magnitude—as well as the specific austerity measures being considered are conducive to socio-economic recovery and the achievement of development goals. The worldwide propensity toward fiscal consolidation can be expected to aggravate the employment crisis and diminish public support at a time when it is most needed. The costs of adjustment are being thrust upon populations who have been relentlessly coping with fewer and lower-paying job opportunities, higher food and fuel costs, and reduced access to essential services since the crisis began. In short, millions of households continue to bear the costs of a “recovery” that has largely excluded them. It is imperative that policymakers recognize the high human and developmental costs of poorly designed adjustment strategies and consider alternative policies that support a recovery for all. 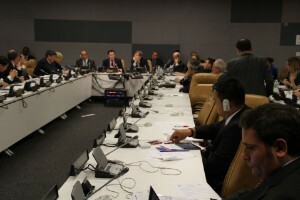 United Nations Social Forum on "People-centred development and globalization"
Dialogue at the 2012 United Nations ECOSOC/Bretton Woods Institutions/World Trade Organizations and UNCTAD meeting. About 50 people participated in this informal lunch-time panel discussion that took place on the occasion of during the annual meeting of ECOSOC with the Bretton Woods institutions, WTO and UNCTAD. The side event was co- sponsored by the Office of the High Commissioner for Human Rights, the NGO Committee on Financing for Development and Social Justice Global Development. The remarkable growth in the extent of international economic integration in recent decades has far outpaced the existing capacity for global economic governance. The intensification of globalisation has increased the inadequacy of the institutions of global economic governance and their policies. This became especially apparent during the Global Financial Crisis, also known as the Great Recession, which began in 2008 and the destructive effects of which still continue. The crisis showed that contemporary national and international economic institutions could not achieve stability let alone other goals. In fact, some of the policies multilateral economic institutions have been commending during the last thirty years contributed to the contagion which spread globally from the US where the crisis began. The frequency and speed with which economic problems in one country spill over to others indicates the importance of strengthening international institutions sufficiently to ensure that they are capable of taking swift, effective corrective action. Enhanced global economic governance would be a key component of renewing the dominant discourse in international political economy. The most cost-effective national economic policies work partly because they are of benefit to other countries, but many are only possible if other countries adopt them too. For example, if all countries collaboratively introduce expansionary macroeconomic policies these then become mutually reinforcing, without damaging asymmetrical externalities. The most widely recognised example amongst economists is that of “beggar-thy-neighbour” tariff increases. When introduced to protect national manufacturing or agriculture, they do so at the expense of reduced global trade, with the aggregate effect being the retardation of economic recovery everywhere. Hard won gains in terms of achieving decent livelihoods and workers’ rights began seriously eroding in 2008 with the onset of the economic and financial crisis. The net effect has been to roll back the gains in those countries and economic sectors where growth and well-being were beginning to make some progress, and to exacerbate the situation for millions of working women and men, already faced with the hardships of informal and precarious working arrangements. A sense of social tension and unrest is palpable in the world community of workers, spanning the popular uprisings in the Middle East and North Africa, through to widespread discontent in face of austerity measures introduced in Greece, Spain, Portugal and Ireland, and to protest movements spawned by proposed legislation to deprive public sector workers in Wisconsin, USA of their collective bargaining rights. And there is a sense that there is more to come. These social upheavals can be traced back to inappropriate and unsustainable models of economic growth and development – models that keep wealth concentrated in a financialized sector with weak linkages to the real productive economy; - models that fail to provide vital public goods such as decent work and livelihoods for all, and democratic spaces for the enjoyment of fundamental human and trade union rights. Global Unions therefore insist on the need for changes in the broader macro-economic framework and policy responses. There is a need for global coordination, so that policies converge and reinforce each other, and remain firmly linked to socially just outcomes, particularly decent work and social protection. How to avoid another financial crisis? September 2009, the President of the General Assembly established the so-called 'Stiglitz Commission', who presented its final report. 18 high-level experts from different regions in the world submitted under the chairmanship of Nobel Laureate Joseph Stiglitz proposals for the stabilization and reform of the international financial and monetary system. One focus of the work were the consequences of the crisis for developing and emerging countries. The Commission sees an urgent need to strengthen international cooperation in the economic and financial sectors in order to achieve a sustainable development of global economic policy. Video (6 min) about the movement "We are the 99%"
The global crises of 2008-2010 forced recognition that global survival depends on more effective international cooperation. Decisions are made by states and national legislation is required to turn international agreements into laws that bind non-state actors, which national courts will enforce. A largely ineffective and politically weak multilateral system could not cope with the crisis. G20 was created to solve the coherence problem. We need a new system for coherent and effective global policy. This new system should be developed that earns the confidence of the people in rich and poor countries, of labor and capital, of public and private sectors. The following scenario envisages a world of “global governance” but not of global government. Proposal for a new system: Two-level structure: New specialized international institutions would address technical policy issues, such as in rules for international trade or cooperation for international financial stability. A new Global Governance Assembly (GGA) should determine the overall principles that guide these aforementioned institutions, and the priorities in terms of resolving conflicts among them. Decision-making procedures: dual voting systems: Decisions should generally be taken by a dual voting system demanding for a specified majority of the number of states voting and a specified majority of weighted votes by economic significance. This voting system makes small states count and the importance of big states is adequately reflected as they have to pay more of the bill. The new system should have a 15-member Global Council as an affiliated body of the GGA. It would include large state members that are elected for 10-year terms and another group elected for two-year terms, with appropriate geographical distribution. The Council would address inconsistencies among specialized institutions and deal with complex economic and political emergencies, including social and environmental emergencies. It would be subject to review by the GGA. The global financial crisis is expected to add 64 million more people in poverty than would have been so in the absence of the crisis. Progress in reducing poverty below US$2 is expected to be slower: about 2 billion people are expected to be living on US$2 or less in 2015. These figures mean that despite significant economic growth in many countries huge numbers of people will remain oppressed by deprivation for the foreseeable future. Even if the MDG target was achieved that would still leave nearly a billion people living in severe poverty. Stronger, equitable economic and social development is essential and so too are additional means of poverty reduction. One mechanism is the possibility of establishing or strengthening social protection as a means of directly reducing income poverty. The right to social protection has been widely recognised for decades and advocated as a cost-effective method of strengthening economic security. The International Labour Organisation (ILO) is currently advocating that the international community should not just repair the problems identified by the crisis in global financial, monetary and economic systems, but should be advocating and supporting the development of a social protection floor to protect people during the crisis, and thereafter. A social protection floor could consist of two main elements that help to realize respective human rights: essential services: ensuring the availability, continuity, and access to public services (such as water and sanitation, health, education, and family-focused social work support); and social transfers: a basic set of essential social transfers, in cash and in kind, paid to the poor and vulnerable to enhance food security and nutrition and provide a minimum income security. A basic social protection package is demonstrably affordable on condition that the package is implemented through the joint efforts of the low-income countries themselves and of the international donor community. Steps towards such programs are already underway in additional countries such as Tanzania, Zambia, Mozambique and Nepal and other countries are expected to start soon. Debt for social protection’ exchange could play a role in inaugurating or capitalising a new scheme. By increasing financial resources for a government at one point a ‘debt for social protection’ exchange could contribute to overcoming initial financial constraints. Another possible means of playing a role would be for debt swaps to be phased over a period of years. In Ross P. Buckley (Ed. ), 2011, Debt-for-Development Exchanges: History and New Applications, New York, OUP, pp 209 - 222. After the recent report of the Intergovernmental Panel on Climate Change and other important dialogues by both Governments and NGOs it has become apparent that costs of Climate Change Adaptation and Mitigation will run into tens of billions of dollars each year. At present these costs threaten to swallow development budgets. Unprecedented choices now need to be made between, for example, protecting forests or building schools. Both are necessary - we must protect the environment and we have to develop the skills of future generations. Additional sources of finance derived from Innovative Instruments are a relatively recent phenomenon. They have been on the sidelines boosting ODA in certain strategic areas such as Immunisation and HIV/AIDS treatments. They now need to move to centre-stage. Years of research into various initiatives has set the scene for the introduction of powerful untapped income streams worth billions of dollars. With the new budgetary pressure of Climate Change, Innovative Finance Instruments need to be introduced. Additional budgetary demands require additional resources. Without them, how can the Millennium Development Goals possibly be met? Stamp Out Poverty campaigns for additional sources of finance to bridge the massive funding gap required to bring the world’s poorest people out of poverty. It is a network of more than 40 UK organisations, including Oxfam, Save the Children, Christian Aid and War on Want, pioneering initiatives such as UNITAID, which has already raised $1 billion for healthcare in developing countries. Additional, long-term finance is needed to pay for the millennium development goals to provide clean water, healthcare and education to the poorest parts of the world. A situation compounded by the financial crisis squeezing traditional aid budgets. Stamp Out Poverty is a leading member of the Robin Hood tax campaign. The International Financial Institutions (IFIs) have tried to control new borrowing with the help of the World Bank’s Debt Sustainability Framework (DSF). This approach is not likely to be overly successful. It unilaterally exerts pressure on the borrower, without providing much of an incentive for the creditor to forego an investment opportunity, simply because it would eventually endanger the borrower’s long-term debt sustainability. There is an extreme danger today that in both, low and middle income countries, a new round of defensive lending by multilateral institutions will start a new debt cycle like the one of the 1990s. It is therefore essential that the provision of fresh funding for Southern countries, which are suffering from the crisis must be accompanied by a new mechanism to deal in a comprehensive way, (i.e. involving all creditors), quickly implementable and in a fair way with new situations of sovereign over-indebtedness. Should the United Nations have a Role in the Reforming the Global Economic System? On June 26, in New York, the high-level United Nations Conference on the World Financial and Economic Crisis and its Impact on Development adopted unanimously an "outcome document" that opens a door - even if only a small one - to a possible UN role in the reform of global financial governance. The preparations for the UN conference, however, were not without severe difficulties. The run-up to the conference highlighted sharp differences between Southern nations, which want to give the United Nations more say in tackling the financial crisis, and Western governments, who prefer to conduct their business within the Group of 20 (G-20) nations. Until now, global financial and monetary issues have been the responsibility of the International Monetary Fund and the Group of 8 and then the Group of 20, relying on the expertise of the Basel Committee on Banking Supervision (BCBS) and the Financial Stability Board, both of which include central banks and treasuries hailing largely from developed nations. However, with the past financial crisis having originated in the North and posing untold negative consequences for the South, political pressure has ramped up on the developed world to include other voices in mitigating this disaster. Impacts of the crisis, such as slowing growth rates, rising unemployment, and declining budgets are beginning to affect developing countries. Developing countries, including the poorest countries, therefore claim that everybody should have a stake in financial regulation. It is in this context that the demand for this global conference on reform of the financial and monetary system emerged. The recent financial crisis shows that systemic problems in the financial system have not been solved. Exchange rate volatility means altering foreign trade prices and amounts of debt service. The accumulation of currency reserves to protect from exchange rate risks ties up tremendous amounts of money, which are lost to a country’s own development. New actors, highly leveraged and non-transparent, such as Hedge Funds and Private Equity Funds are a threat to financial stability. Complex instruments and most derivatives are uncontrolled by supervisory bodies. Unregulated offshore centers and tax havens make capital flight and tax evasion easy. Capital flight and tax evasion remove funds needed for government spending in developing countries. Current proposals are insufficient. Broader international space is required for discussion among all relevant stakeholders including civil society. International regulatory frameworks are needed which allow countries, especially in the developing world to preserve and ensure economic stability. The recent financial crisis emanating from Wall Street and its consequences shows that systemic problems of the financial system are not a thing of the past. The crises and ensuing credit turmoil have also renewed attention to the drawbacks in credit rating agencies, financial standards (in particular Basel II) and the bodies that design them, and the roles of supervisors and regulators. Unfortunately, measures proposed in the Monterrey Consensus that would have helped prevent the crisis or its unfair consequences remain unheeded. The Financing for Development (FFD) follow up process should be taken as a setting for crafting a multilaterally and politically agreed vision and guidance for global and regional economic institutions in charting their future roles, while also identifying the institutional gaps and deficiencies that have helped trigger such crises. Development-oriented macroeconomic policies, debt mechanisms and innovative financing measures are critical to achieve the MDGs United Nations General Assembly hearings on the Millennium Development Goals. In the last few years, as the world economy has experienced both a financial and an economic crisis of magnitude proportions, the predominant arrangements and assumptions of the model for economic development and global finance has also come into a fundamental crisis of its own. As the shock waves of the global financial crisis rippled over the developed world, painful repercussions were generated for developing countries, which are still reeling from the deep contraction in world demand and the consequent decreases in export earnings, FDI and private capital flows, and remittances, despite news headlines and official reports that say the world is now in a ‘post‐crisis mode.’ These effects not only exacerbate the already existing challenges in achieving the MDGs, but also point to systemic flaws and gaps in the economic development model pursued by most developing countries, such as macroeconomic policies, debt measures and financial liberalization. A central challenge in creating this basis is not the lack of explicitly economic goals in the MDG framework, but rather the challenge of formulating a policy strategy, in the context of an imbalanced global financial and trade system, that would back up the human‐development ambitions of the MDG framework. Many NGO networks have long campaigned on and monitored the impacts of unjust and unsustainable debt and now want to respond to new challenges that have emerged in the five years since Monterrey. It is important to put into context the scope of external debt held by developing nations. While there is no doubt that debt financing can be a critical tool for mobilizing resources for public and private investment and economic development, we remain concerned about the crushing burden that this debt continues to represent for many developing nations. Developing country debt today stands at US$2.85 trillion, up from US$2.24 trillion in 2000 and US$1.3 trillion in 1990. Developing countries paid out more than US$540 billion in debt service in 2005. Indeed, low income countries continue to pay out $100 million each day to creditors, diverting large sums of scare government revenue to external debt service and away from investments needed to reach the Millennium Development Goals (MDGs).